I hope that you enjoyed time with friends and family during spring break last week. It has been such a busy week back that it seems like spring break was a month ago. We celebrated members of the Kappa Nu chapter of Phi Theta Kappa at the spring induction ceremony Tuesday evening. Nearly 100 students pledged to uphold the standards of the national honor society. Recognizing our students is one of the most rewarding opportunities we have to experience. On Wednesday, we celebrated the Grand Re-opening of the Ocala Campus Learning Resources Center. The LRC has gone through a number of transitions through the years, but none like what we are seeing now. The new LRC contains an open collaborative learning commons, mindfulness room, a conference room, Cliff’s Cyber Café, and a variety of comfortable and functional furniture – including the ability to charge devices in as many places as possible. 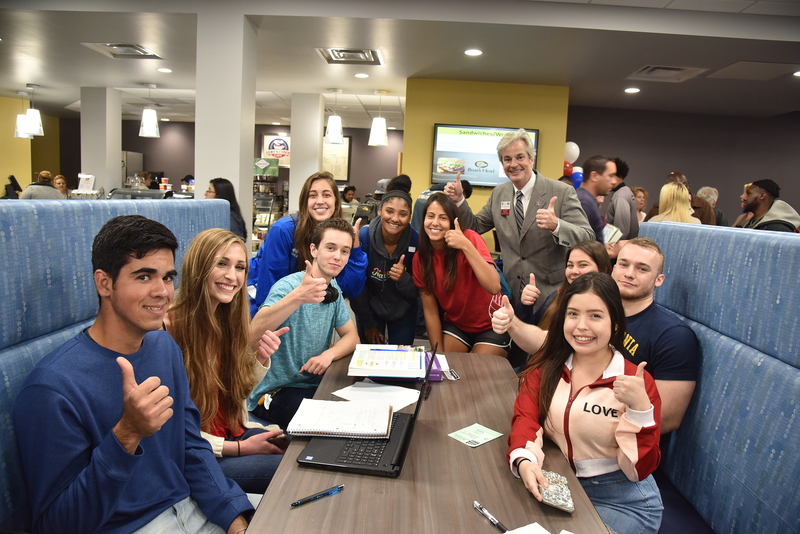 Special thanks to all the faculty and staff who have reimagined the student learning experience and have delivered an environment to foster success. An especially big thank you to our facilities team and project manager Katie Hunt. On Saturday, we will participate in Marion County’s 175th anniversary celebration at McPherson Field in Ocala. While CF has been around for only 62 of those years, we have played a significant role in helping to shape the community. The festival is from 10 a.m. to 4 p.m. and we will share information about the college’s history. We received a report last week from Florida TaxWatch that reaffirms what we have been saying: Going to college pays! 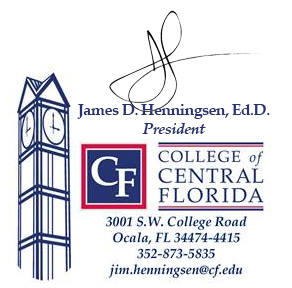 The report says that the Florida College System provides a significant return on the state’s investment, increases expected work life earnings for students, and compares favorably to colleges nationally in terms of enrollment and graduation rates. According to the Florida TaxWatch report, students experience increased expected work-life earnings of $491,777 to $838,023. They can repay the cost of their education anywhere from 2.50 to 3.80 years. You can read the full report here. We are now entering the fifth week of legislative session, with five weeks to go. Last week the House and Senate provided the first round of budget proposals. We remain confident that we will receive funding for college operations, construction of the Health Science Technology Education Center and restoration of state funding for the Appleton Museum of Art. Two weeks ago, all colleges and universities with prior funded building projects that have not begun construction were summoned to testify to the House Higher Education Appropriations Subcommittee. We were one of those colleges (Health Science building). The purpose was for the committee to review and determine which projects they felt had merit to be funded. The good news is that of the 32 projects presented, we were one of only 14 projects that they kept on the list for state funding. Special thanks to Trustees Brancato and Winsler for attending the hearing and all of our team members who scrambled to get me the information needed to make a great presentation! We also learned this week that CF ranked the No. 9 Best Online Community College in Florida by SR Education Group. The ranking was based on retention rate, graduation rate, and percentage of online enrollment data from the Integrated Postsecondary Education Data System. The number of online associate degrees offered was collected from school websites and was also considered in the ranking. As we prepare for spring graduation, we are informing students that tickets will be required to attend the commencement ceremony. We want to ensure that each graduate has a family member or friend in the audience, and tickets are the most equitable way to provide that opportunity. Information is posted at www.CF.edu/graduation and will be updated as needed. Our goal is to provide a positive experience for graduates and their guests. Thanks for all that you do for our students and the community!